I should really eat more fish but mussels are so much easier to cook, not to mention way cheaper. This time I made it even simpler. My usual way of cooking is oil, garlic, onion, add mussels and hit it with chicken stock. Last month I had made a jar of green curry sauce by combining green curry paste, soy sauce and palm sugar. I love making ready-to-use sauces, great for cooking and marinating. Get a pan hot, add oil and add mussels. Stir. Pour about 3/4 cup of the green curry sauce and about the same amount of liquid (I used water). Stir. Cover the pan and cook for 3 minutes. Check mussels after 3 minutes, cover back up and cook longer if there are any that aren’t open. Scoop the mussels out and leave the broth in the pan. On high flames, add a big tablespoon or 2 of creme fraiche and some chopped scallions. Stir to melt the creme fraiche. Taste it. Add more curry sauce if it’s too weak. Let the sauce reduce a bit. 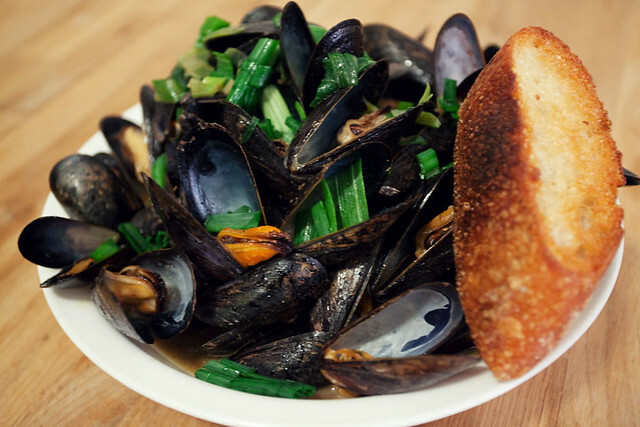 When done, pour sauce over mussels and sprinkle some chopped scallions. Serve with toasty bread.